So, I have a secret and I’m finally going to let it out of the bag 🙂 If you’ve been a crochet blogger for any length of time, you know what a pain in *$@@ it is to create a crochet pattern roundup. I mean, I love them, but they take forever…and getting permission from 5, 10, 15 other bloggers? It can feel like an overwhelming task, but don’t worry! I have a secret trick that is going to help you create a quick and easy crochet pattern roundup. And, yes, all your bases will be covered with copyright permissions and high-quality designs without having to search for hours. Don’t believe me? Well, check this out…my secret is called Custom Search Engine and it’s brought to you by our good friends at Google. 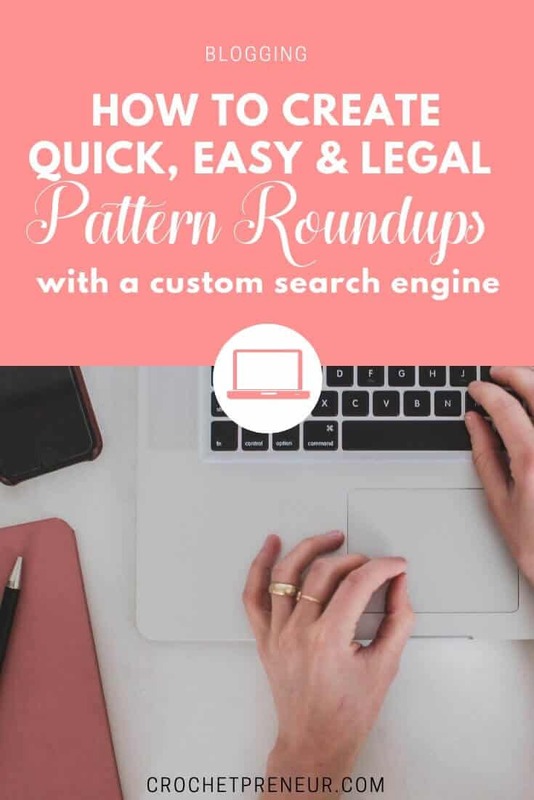 By creating a custom search engine (I’ll show you how, below), you’ll be able to predetermine the designers you trust to create quality patterns and you’ll already have their permission to use an image with a link back to their site. It’s a real time saver! Google’s Custom Search Engine allows you to tell Google exactly what sites to search for your roundup patterns. Just put in your search and it will only return matches from the sites you’ve chosen. Easy, peasy. Just go to the site, grab your photo and link, and you’re in business. Before you create your custom search engine, you’ll need to do a little footwork. Trust me, though, a little time now will save you a whole lot of time in the future. I gathered up the URLs of several of my favorite crochet blogs and put them in a spreadsheet along with a link to the FB post where they gave consent. Then, I was ready to create my Custom Search Engine. You will be brought to this screen – humble as it is, it is your very own custom search screen. You’re ready to search! Just type in your search term and you’re ready to create a quick and easy crochet pattern roundup! Here is an example of when I search “hat” in my own custom search engine. Granted, I only added one site, so it’s only showing me options from my own page. Let’s take a look at how we would add additional site to our search engine. Once again, go to your Google Search Engine homepage. Click on the name of the search engine you’d like to search. Now, any time you’d like to create a roundup, simply go to your Custom Search Engine homepage at https://cse.google.com/cse/all. Click on the link in the “Public URL” column next to the name of the search engine you’d like to use. Enter your search term into the query box and click the magnifying glass. And you’re ready to start creating your crochet pattern roundup without having to worry about requesting permission to use images. All you bases are covered! Just a little tip: If you don’t want to have to go to type in the URL for the Custom Search Engine homepage every time, add it to your Bookmarks bar on your computer and you’ll only need to click there to begin creating a crochet pattern roundup the easy way! So, tell me. Was this new to you? Will you be creating a custom search engine to help with your roundups? Be sure to add Crochetpreneur to your search engine and let me know, in the comments below, if you’d like to be added to mine.